At least, we can wish so for John Updike, the creator of the vivid American everyman Harry “Rabbit” Angstrom, who through several novels fell from the heights of high school basketball stardom into the cultural maelstrom of the 1960s and ’70s, tried the straight and narrow, made a fool of himself over women, became desperate, became rich, became old, and always, always, kept searching for … for what? For whatever it is we search for in this nervous, impatient nation of ours. To me, there was honor in that so-American attempt to create myth from the everyday and supposedly mundane, as he did in his Rabbit novels and in such writings as his early novel The Centaur. Stylistically the two writers had almost nothing in common, but it’s apt to note that, in the theatrical world, Arthur Miller did the same thing. And wasn’t Walt Whitman, when he sang the possibilities of the men and women of this adolescent country, thinking of the same sort of people who would come to find themselves caught in the webs that Updike strove to understand? For all of Rabbit’s importance, and for all the fuss his Witches of Eastwick and other novels sometimes kicked up, I have an abiding affection for another Updike character: Henry Bech, the irascible, august fictional novelist who eventually ascends from the mess of his everyday existence to become a winner of the Nobel Prize. 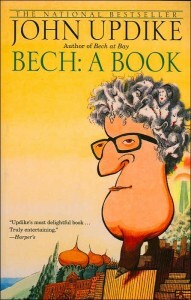 Bech is the central character in what may be the funniest scene ever written about writer’s block — when he sits on a Caribbean beach, drinks and nubile companionship and fat publisher’s fee at hand, with no task but to autograph a huge pile of one of his novels, and finally becomes so paralyzed that his pen freezes in midair: He’s forgot his name. We’ll not forget the names of Bech, and Rabbit, and John Updike. Rest well, gentlemen. You deserve it.